Original plate greg achille heel mystere man has 2 heads 1976 page 40 ... Superb board with all the characters! 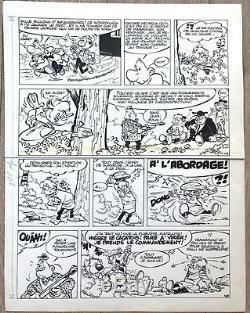 A classic of the Franco-Belgian comic has price still available !! otherwise hand delivery (preferable) on paris at the bookstore bdcaptivant - 7 rue st victor -75005 paris afternoon mainly or by appointment at 06 1541 4700. Thank you for your interest in this object. The item "original plate greg achilles heel mystere man has 2 heads 1976 page 40" is on sale since Sunday, April 22, 2018. It is in the category "books, comics, magazines \ bd \ boards, original drawings".